Over the past year the maritime security industry (anti-piracy) has changed significantly. While pirate attacks continued to increase through 2011, successful (in the view of the pirates) hijackings began to taper-off then decline toward the end of 2011. By December 2011 attacks were down 65% and actual hijackings were down 85% from November, 2010 (read the post here). The decline in successful hijackings can be attributed to a number of factors including adoption of BMP4, use of armed guards, convoys and so on. Regardless of the reasons, from a market perspective the impact is the same. Within the same time period the entrants into the anti-piracy arena increased an estimated 4 fold. From the early days of RedFour, PVI, Trident and Nexus came a new rash of entrants as every former Marine, Commando, SEAL and other tactically minded person was attracted to the seemingly easy revenue present in the industry. A look at the ICOC membership as of December 1st, 2011 shows 266 signatories. Using the ICOC as a barometer one can see the explosive growth. On November 9th, 2010 the ICOC had 13 signatories. 13 more signed on February 1st, 2011. 24 more signed in April, 2011, and so on. Of the 266 signatories over 150 appear to provide Maritime Security services. Considering that there are numerous companies that have not yet signed, it is fair to assume that the number of Maritime Security Companies now stands at about 200. While this is not a class on Porter’s Competitive Forces, there is some value to be garnered from Porter’s studies. Porter made it clear that choosing a firm’s relative competitive position within a selected industry is a decision of secondary importance. The 5 forces provide a framework which allows for the identification of the anticipated profitability within an industry or segment and help companies stake a position within the industry. A very quick, high-level analysis of the market shows that we are headed for the inevitable shakeout and consolidation of the market. Currently, the large number of competitors jockeying for position means that the maritime security industry appears fragmented but this is only temporary and does not tell the full story. I say ‘appears’ because concentration ratios and other factors tell a different story. For those who study competitive theory a fragmented market is good as it generally indicates a profitable industry. 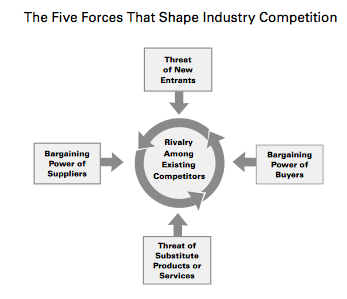 Porter’s framework consists of five fundamental competitive forces. Commentary has been added to each to show the movement toward consolidation. 1. Entry of competitors– assessing the ability of new entrants to start operations and the structural barriers they must overcome; (Comment) The less the barriers to entry, the greater number of competitors will enter the market driving prices down as competition increases. It should be noted that the barrier to entry to ‘creating’ a maritime security company is low however the barrier to entry in successfully operating a company is high. There is quite a bit of noise caused by entrants that have no capability to actually deliver on maritime services they are selling. 2. Threat of substitutes–assessing the ability of new products with superior characteristics to replace existing product(s) or service(s); (Comment) While armed guards seem to be the panacea of security, BMP4 and other tactics are proving effective, as well leading some to question the need for armed guards. 3. Bargaining power of buyers– assessing the relative strength and number of buyers;* (Comment) the disparity in the size of the buyers (shipping companies) and the suppliers (armed security companies) coupled with the large number of entrants creates a situation in which buyers have strong bargaining power. Prices continue to drop. 4. Bargaining power of suppliers– assessing the relative strength and number of sellers;* (Comment) with the exception of the few large player, suppliers generally have little, if any bargaining power. 5. Rivalry among the existing players– assessing the relative competitive strength of rival firms. * (Comment) There is increasing rivaly among the players as new entrants enter the market. Several large players are beginning to predominate the industry showing a trend toward consolidation. * Concentration ratio (CR): the percent of market share held by the four largest firms within an industry is frequently used as a leading measure. A high CR means that few firms hold a large market share, are less competitive, and create a less competitive, more monopolistic landscape. Less competition leads to higher profit margins. A low concentration ratio indicates that an industry is characterized by many rivals, none of which has a significant market share. These fragmented markets are said to be competitive. (Comment) Going back to my previous statement. There are a huge number of new entrants but the vast majority of these companies are simply ‘hoping and praying’ that they can land a client. Some companies have managed to sign clients only to realize that they cannot operationally support the clients. It should be noted that the decrease in hijackings is anticipated to result in a reduction in the demand for armed security. (at least temporary reduction until an event such as an increase in hijackings causes an new demand). Additionally, the increasing number of entrants is going to continue to drive profit margins down until there is a shakeout in the market. It is a fair assumption at this point to say that within the next 12 months, an estimated 50% of the maritime security companies within the industry will be nothing more than a vanity company (no business just a name) or will be out of business while the major players with the operating capital, economies of scale, and operational expertise will survive the shakeout and continue to grow as the industry continues to consolidate. The end result with be a more mature, disciplined industry with fewer entrants and more consistent profit margins. Unfortunately for the vast majority of industry entrants, their foray into the market will likely be short lived as they are either forced out, or acquired by the larger competitors as the market continues to consolidate. Thanks for the mention! Looking forward to taming the dragon and staying on the list for your mid-year and 2013 reviews! You should give out CEU’s to the MBA’ers for following the 5 Forces concept!